Ah, Minecraft. This had been one of those games that I had heard about, but had the stubborn Taurus in me had always refused to play it. Like World of Warcraft before it (which I have also to this day avoided), I knew Minecraft would be a game that I would easily get addicted to. Whilst I enjoy a spot of gaming, did I really want to waste so many hours building my own utopia? As you'll find out in this review, I often succumb to temptation. It's how I am with chocolate, a book, or finishing "just one more level" or a game. I had succumbed to the pull of Minecraft, bit the bullet, and bought the Xbox 360 Edition? And what do you think happened? Of course, I got addicted to it. Minecraft follows a rather simple concept of mining resources, then creating a whole manner of places. Like the hours I spent in front of Lego as a child, Minecraft allows you to embrace not only your creativity, but the child inside of you as well. Whether you are re-creating a full scale version of the Deathstar (look on YouTube...there are even bigger examples than that also! ), or you are simply making your idyllic house, the game gives you enough free reign to just get on with it, and enjoy it however you please. Many people do not like the idea of free-reign in a game, and in a way, I agree with them. The Xbox 360 Edition would benefit from some kind of adventure/quest mode for those wishing for more of a challenge once they ideal pixel world has been exhausted. However, the freedom does offer a lot of fun, especially on multiplayer. I have been playing Minecraft with three other friends, where we have created a huge world for ourselves complete with log flumes, castles, epic scenic minecart rides, underwater realms and more. Playing with other people allows you to set yourselves objectives, so it is almost like having a quest mode anyway. 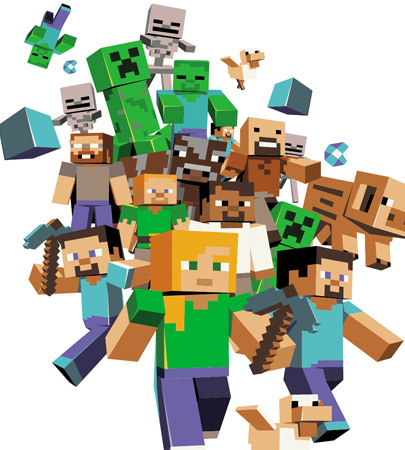 No mention of Minecraft would be complete without discussing the games monsters. If you decide to bump up the difficulty past "peaceful mode" (something which comes in handy when you are wishing to make a huge structure without interruptions), then you'll encounter the games host of nasties. Creepers, live up to their name. They'll silently creep up on you and explode when they come into contact. There are also zombies, bow-wielding skeletons, and spiders. And that's just the normal world. Create a portal to the netherworld and you'll encounter even more creepy creations. The key to avoiding these beasts is to litter the area with plenty of torches as they only spawn in dark places.